Demand for Australian bullion coins bounced in June after a slowing in May, and soared through the first half of this year, according to the latest figures from the Perth Mint of Australia. The Mint’s silver coins scored above the million ounce level for the ninth time in ten months and its gold sales rebounded from an at least 3-year low. Perth Mint bullion sales registered against a backdrop of soaring precious metals with London fixings in June logging advances of 9% for gold and 14.3% for silver. The Perth Mint sold 31,368 ounces in gold coins and gold bars last month for a 49.1% increase over May when sales ranked the weakest since CoinNews started tracking the Mint’s data in February 2013. Sales climbed a more modest 1.1% above the same month from a year earlier. 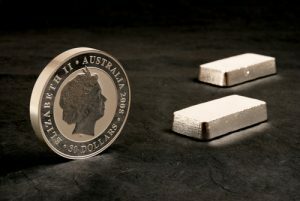 "Stronger investor sentiment in June resulting from the UK’s Brexit vote helped reverse the decline in sales of Australia coins and bars evident over the past two months," the Perth Mint said. Gold sales through the first half of 2016 tally to 232,715 ounces, up 38% from last year’s starting six-month total of 168,650 ounces..
Perth Mint sales of silver bullion jumped by 1,220,817 ounces last month, notching gains of 25.2% from the previous month and 217.4% from June 2015. Silver sales through the first half of the year total 7,636,156 ounces, smashing last year’s January to June total of 2,810,994 ounces by 171.7%. Below is a monthly breakdown of Perth Mint bullion sales from June 2015 to June 2016. The figures show monthly ounces of gold and silver shipped by the Minted Products division of The Perth Mint to wholesale and retail customers worldwide. It excludes sales of cast bars and other Group activities including sales of allocated/unallocated precious metal for storage by the Depository. Perth Mint Australia is offering a unique (mintage of 1 coin) gold coin for $1 million. It is the 1-kilo gold Kangaroo with a rare red diamond from an Australian mine set into the coin. It is on display & available for purchase at the Mint’s Hay Street location in Perth. I think that the Perth Mint offer a wide range of some of the finest, unique coins on the market tody. I also think the Royal Canadian Mint does the same. Mint like the U.S. Mint should take notice and start doing the same instead of minting almost 50 Million Silver Eagles last year, they could have made some more unique coins. You are so right! I have been purchasing more low mintage coins from Perth Mint Australia & RCM over the past few years & cutting back on some of the common US Mint coins. Diversity and quality along with an excellent company help make for great collecting. The U.S. Mint just keeps minting what seems like the same old, same old. The best thing I can say about this year’s coins from the U.S. Mint are the gold Dime, Quarter and Fifty Cent piece. I do wish they were made in one ounce of .999 gold like the Buffalo nickle and I’m hoping for a 5 ounce high releif Silver Eagle. Nice to hear from you. Good ideas for new MInt products. I wish the US Mint’s customer service was as good as the RCM & Perth Mint Australia! They have the best customer service & really know how to take care of their loyal customers.